The government is going all out to spread awareness about the new indirect tax regime, and training lawmakers is being seen as a necessary first step. The objective, Dilasha Seth and Archis Mohan find, is to convey to the masses, through every intermediary possible, that the GST is consumer-friendly. 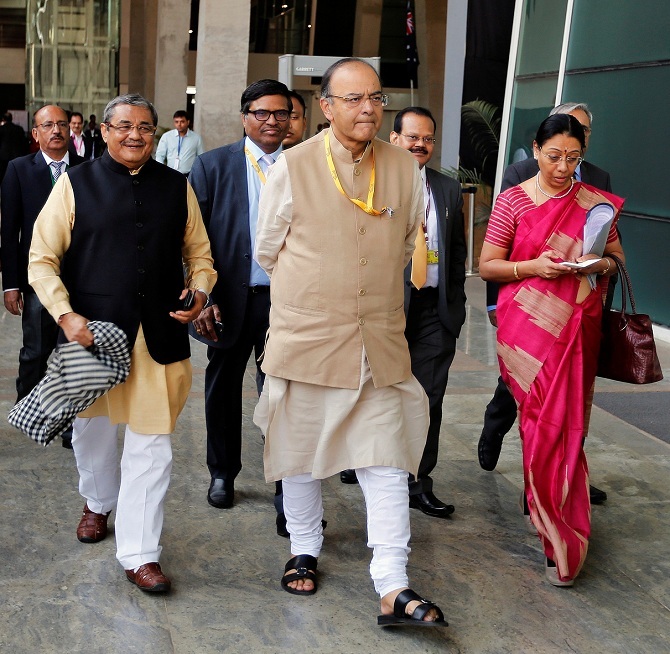 IMAGE: Finance Minister Arun Jaitley, centre, arrives at a GST seminar in Gujarat. Along with training, the government is advertising in a big way on GST. Photograph: Amit Dave/Reuters. The Narendra Modi government is going all out to spread awareness about the new indirect tax regime, and training MPs as well as MLAs is being seen as a necessary first step. The objective is to convey to the masses, through every intermediary possible, that the GST is a consumer-friendly measure and that the tax incidence will not rise under the new regime, a top government official said. Revenue Secretary Hasmukh Adhia briefed the prime minister and the council of ministers on the basic GST structure at the Prime Minister's Office last week. MPs, too, were given a GST briefing during the recently-concluded Parliament session, but more is likely to follow in the coming days. All states have been asked to conduct training for MLAs to educate them and dispel misinformation over the new tax structure. "We have written to all state governments to convene sessions and conduct training for MLAs. If they need resources in the form of trainers, they will be provided from the department (Central Board of Excise and Customs)," said an official. Educating MLAs will be key to preventing the public from being misled about the GST rates, the official said. For instance, currently only the sales invoice has the VAT component, but the GST will include both VAT and excise, making the tax component appear higher than earlier. "It is not true as excise was charged earlier too, but it was not mentioned in the invoice. We do not want people to be misled on grounds that VAT was charged at 5 per cent, but its 18 per cent under GST." The government is working overtime to make businesses ready for GST as well. It has already signed a pact with 12 institutions to carry out training for trade and industry. The National Academy of Customs Excise & Narcotics (NACEN), apex institute of the government for capacity building in the field of indirect taxation, has signed a memorandum of understanding (MoU) with institutes such as Amity University, Institute of Chartered Accountants of India (ICAI), National Institute of Financial Management (NIFM), National institute of MSME, NIIT, OP Jindal Global University for imparting training. The government picked up 12 of more than 100 institutes which had applied. "These institutes have been sifted on the basis of quality to ensure that the information given out is authentic and at an affordable cost," said another official. The course fee has been capped at ₹2,500 per class and ₹7,500 for a three-day session. Another half a dozen institutes are likely to be chosen for the purpose. Laghu Udyog Bharati, a union of micro and small enterprises and an affiliate of the Sangh Parivar, has applied to the government too to be recognised as a trainer. "We have formally applied to the government. We are hopeful that we will be recognized one of the trainers for the sector," LUB's Delhi chief Sampat Toshniwal said. The outfit has 16,000 small and micro enterprises across 290 districts as its life member, and over 100,000 enterprises in the sector as its annual members. The CBEC has already trained around 60,000 officers of both the centre and states since last September. Along with training, the government is advertising in a big way on GST, through radio jingles, banners and posters in metros and bus stops, besides on traditional media. Not only that, CBEC zonal chief commissioners have been asked to conduct programmes in locations with population ranging from 100,000 to 200,000. The CBEC is also planning to come out with thin booklets with FAQs on specific issues like registration, return filing, payments, and input tax credit. Among others, software solutions firm Tally has conducted more than 5,000 events and reached out to more than 200,000 and will conduct several thousand events before July to ensure that businesses have a smooth transition to GST. ClearTax too is carrying out programmes to educate SMEs, MSMEs, CAs and enterprises before the GST roll-out. The Confederation of All India Traders, an umbrella body of traders, has initiated its training modules and claims to have conducted 113 conferences across India in the past 100 days. Its national general secretary Praveen Khandelwal said another 100 conferences are planned for traders by June 30. Does GST help the common man? Scroll down for more insights. What is the biggest concern about GST?